Pratītyasamutpāda (Sanskrit: प्रतीत्यसमुत्पाद; Pali: पटिच्चसमुप्पाद paṭiccasamuppāda), commonly translated as dependent origination, or dependent arising, states that all dharmas ("things") arise in dependence upon other dharmas: "if this exists, that exists; if this ceases to exist, that also ceases to exist." It is a pragmatic teaching, which is applied to dukkha (suffering, unease) and the cessation of dukkha. The principle is applied in the twelve links of dependent origination doctrine in Buddhism, which describes the chain of causes which result in rebirth and dukkha. By breaking the chain, liberation from this endless cycles of rebirth and dukkha can be attained. Everything except nirvana (nibbana) are the consequence of Pratītyasamutpāda, asserts Buddhism. This principle complements its teachings of anicca and anatta. pratitya: "having depended"; it appears in various Vedas and Upanishads, such as hymns 4.5.14, 7.68.6 of the Rigveda and 19.49.8 of Atharvaveda, in the sense of "confirmation, dependence, acknowledge origin". The Sanskrit root of the word is prati* whose forms appear more extensively in the Vedic literature, and it means "to go towards, go back, come back, to approach" with the connotation of "observe, learn, convince oneself of the truth of anything, be certain of, believe, give credence, recognize". In other contexts, a related term pratiti* means "going towards, approaching, insight into anything". samutpada: "arising", "rise, production, origin"[web 1] In Vedic literature, it means "spring up together, arise, come to pass, occur, effect, form, produce, originate". The term may also refer to the Twelve Nidānas, the twelvefold chain that describes the chain of endless rebirth in Saṃsāra (Buddhism). [quote 2] Generally speaking, in the Mahayana tradition, pratityasamutpada (Sanskrit) is used to refer to the general principle of interdependent causation, whereas in the Theravada tradition, paticcasamuppāda (Pali) is used to refer to the twelve nidanas. According to Alex Wayman, the idea of "dependent origination" may precede the birth of the Buddha, and the first four causal links starting with Avidya in the Twelve Nidanas are found in cosmic development theory of the Brihadaranyaka Upanishad and other older Vedic texts. Terms synonymous to Pratītyasamutpāda are Apekṣhasamutpāda and Prāpyasamutpāda. The concept of causality and causal efficacy where "cause produces an effect because a property or svadha (energy) is inherent in something", appears extensively in the Indian thought in the Vedic literature of the 2nd millennium BCE, such as the 10th mandala of the Rigveda and the Brahmanas layer of the Vedas. [note 2] The Pratityasamutpada doctrine is an extension of this, however pratityasamutpada doctrine asserts neither direct Newtonian-like causality nor a single causality. Rather, it asserts an indirect conditioned causality and a plural causality. Buddhist thought, states Gethin, does not understand causality in terms of Newtonian mechanics, where "billiard balls rebound off each other in an entirely predictable manner once the relevant information is gathered." The "causal link" propositions in Buddhism is very different from the idea of causality that developed in Europe. Instead, the concept of causality in Buddhism is referring to conditions created by a plurality of causes that necessarily co-originate phenomena within and across lifetimes, such as karma in one life creating conditions that lead to rebirth in one of realms of existence for another lifetime. According to Peter Harvey, Pratityasamutpada is an ontological principle; that is, a theory to explain the nature and relations of being, becoming, existence and ultimate reality. Buddhism asserts that there is nothing independent, except the state of nirvana. All physical and mental states depend on and arise from other pre-existing states, and in turn from them arise other dependent states while they cease. The 'dependent arisings' have a causal conditioning, and thus Pratityasamutpada is the Buddhist belief that causality is the basis of ontology, not a creator God nor the ontological Vedic concept called universal Self (Brahman) nor any other 'transcendent creative principle'. The Pratītyasamutpāda principle asserts that the dependent origination is necessary and sufficient condition in both directions. This is expressed in Majjhima Nikaya as "When this is, that is; This arising, that arises; When this is not, that is not; This ceasing, that ceases." The Pratītyasamutpāda ontological principle in Buddhism is applied not only to explain the nature and existence of matter and empirically observed phenomenon, but also to the nature and existence of life. In abstract form, according to Peter Harvey, "the doctrine states: 'That being, this comes to be; from the arising of that, this arises; that being absent, this is not; from the cessation of that, this ceases'." There is no 'first cause' from which all beings arose. Against Harvey's ontological interpretation, Eviatar Shulman argues that "dependent-origination addresses the workings of the mind alone. Dependent-origination should be understood to be no more than an inquiry into the nature of the self (or better, the lack of a self). Viewing pratitya-samutpada as a description of the nature of reality in general means investing the words of the earlier teachings with meanings derived from later Buddhist discourse." Shulman grants that there are some ontological implications that may be gleaned from dependent origination, but that at its core it is concerned with "identifying the different processes of mental conditioning and describing their relations." According to Stephen Laumakis, pratītyasamutpāda is also an epistemological principle; that is, a theory about how we gain correct and incorrect knowledge about being, becoming, existence and reality. The 'dependent origination' doctrine, states Peter Harvey, "highlights the Buddhist notion that all apparently substantial entities within the world are in fact wrongly perceived. We live under the illusion that terms such as 'I', self, mountain, tree, etc. denote permanent and stable things. The doctrine teaches this is not so." There is nothing permanent (anicca), nothing substantial, no unique individual self in the nature of becoming and existence (anatta), because everything is a result of "dependent origination". There are no independent objects and independent subjects, according to the Pratītyasamutpāda doctrine, there is fundamental emptiness in all phenomena and experiences. The 'dependent origination' doctrine is presented in Vinaya Pitaka 1.1–2, in abbreviated form in Samyutta Nikaya 2.1, 2.19 and 2.76. The doctrine is a key element in other Buddhist teachings. The twelve nidanas apply the Pratītyasamutpāda doctrine. The Four Noble Truths are an expression of the principle of dependent origination, states Bhikkhu Thanissaro, because they explain the arising of dukkha which is dependently originated, and the cessation of dukkha by removing the "causes." Others, such as Étienne Lamotte offer a more nuanced view, stating that only the second and third truths in the Four Noble Truths are related to the principle of dependent origination, the first and the fourth truths are mere statements and do not illustrate or apply pratītyasamutpāda doctrine. Even in the case of those two truths where dependent origination is applied, the order is different; more specifically, the second truth applies dependent origination in a direct order, while the third truth applies it in inverse order. Thus, the Four Noble Truths and the pratītyasamutpāda doctrines are connected, but independent and separate, not implied. The pratītyasamutpāda doctrine connects the Four Noble Truths to the Twelve Nidanas doctrine of Buddhism, states Ian Harris. The second truth is compatible with the twelve 'dependently originated' links from Avidya to Jaramarana (old-age and death). The third truth is compatible with its reversal, which results from the broken link because of an end to Avidya. The Twelve Nidanas are a series of causal links that describe the process of samsaric rebirth and the arising of dukkha. In reverse order they also describe the way to liberation from samsara. Each of the twelve links illustrate "dependent origination", and they explain the process of rebirth and the arising of dukkha. [web 2] When certain conditions are present, they give rise to subsequent conditions, which in turn give rise to other conditions; these 'conditioned arising' result in the cyclical nature of rebirths and redeaths in Samsara. The attainment of nirvana, in Buddhist belief, ends the process of rebirth and associated dukkha. It is achieved by breaking a link in the twelve nidanas (links) of conditioned co-arising. The Karma theory of Buddhism is integrated into its Twelve Nidanas doctrine, and has been extensively commented on by ancient and medieval Buddhist scholars such as Nagarjuna. Karma consists of any intentional action, whether of body or speech or in mind, which can be either advantageous (merit) or disadvantageous (demerit). Both good and bad karma sustain the cycle of samsara (rebirth) and associated dukkha, and both prevent the attainment of nirvana. According to Nagarjuna, the second causal link (sankhara, motivations) and the tenth causal link (bhava, gestation) are two karmas through which sentient beings trigger seven sufferings identified in the Twelve Nidanas, and from this arises the revolving rebirth cycles. To be liberated from samsara and dukkha, asserts Buddhism, the 'dependent origination' doctrine implies that the karmic activity must cease. One aspect of this 'causal link breaking' is to destroy the "deeply seated propensities, festering predilections" (asavas) which are karmic causal flow because these lead to rebirth. The Buddhist mechanistic theory of how karma impacts across multiple lives of a being are explained in medieval Buddhist texts by applying the "dependent origination" doctrine on one life of a single person, two lives of a single person, and three lives of a single person. The "three lives" idea was discussed by Buddhaghosa and Vasubandhu. The first two nidanas, namely ignorance (nescience) and motivation relate to the previous life and forecast the destiny of the person. The next five dependent arising links in the Twelve Nidanas, go with the person's present destiny, and condition the present life's existence. The next three dependent originations, namely craving, indulgence and gestation foster the fruits of the present destiny, while the eleventh and twelfth nidanas, birth and death destine the next life in Buddhist thought. The details of the three lives have historically varied between the Buddhist traditions, but they all accept the rebirth and dependent origination doctrines. The Pratītyasamutpāda doctrine, states Mathieu Boisvert, is a fundamental tenet of Buddhism and it may be considered as "the common denominator of all the Buddhist traditions throughout the world, whether Theravada, Mahayana or Vajrayana". Another Theravada interpretation of the twelve links sees them as explaining psychological or phenomenological processes in the present moment. In Buddhaghosa's Sammohavinodani, a commentary to the Vibhanga of the Abhidhamma Pitaka, the principle of Dependent Origination is explained as occurring entirely within the space of one mind moment. According to Prayudh Payutto there is material in the Vibhanga which discusses both models, the three lifetimes model and the phenomenological mind moment model. This thesis is also defended by Bhikkhu Buddhadasa's Paticcasamuppada: Practical Dependent Origination. In this interpretation, Birth and Death refer not to physical birth and death, but to the birth and death of our self-concept, the "emergence of the ego". According to Buddhadhasa: "dependent arising is a phenomenon that lasts an instant; it is impermanent. Therefore, Birth and Death must be explained as phenomena within the process of dependent arising in everyday life of ordinary people. Right Mindfulness is lost during contacts of the Roots and surroundings. Thereafter, when vexation due to greed, anger, and ignorance is experienced, the ego has already been born. It is considered as one 'birth'". Instantaneous - All 12 links are present in the same instant. Prolonged - The interdependence and causal relationship of dharmas or phenomenal events arising at different times. Serial - The causal relationship of the twelve links arising and ceasing in continuous series of moments. Discussing the three lifetimes model, Alex Wayman states that it is different from the Vajrayana view, because Theravadins denied bardo or an intermediate state between death and rebirth. This denial necessitated placing the first two nidanas of the "dependent origination" chain into the past life. The Tibetan Buddhism tradition allocates the twelve nidanas differently between various lives. Whatsoever that is not empty. In his analysis, any enduring essential nature (svabhāva) would prevent the process of dependent origination, would prevent any kind of origination at all, for things would simply always have been and will always continue to be, i.e. as existents (bhāva). Madhyamaka suggests that impermanent collections of causes and conditions are designated by mere conceptual labels, which also applies to the causes and conditions themselves and even the principle of causality itself since everything is dependently originated (i.e. empty). If unaware of this, things may seem to arise as existents, remain for a time and then subsequently perish. Emptiness (absolute or ultimate truth) refers to the concept that the ‘’nature" of all phenomena is emptiness—lacking inherent existence. The appearance of the moon in the water is an expression of dependent origination—the appearance is completely dependent upon causes and conditions. My actions and respect for cause and effect are as fine as grains of flour. Sogyal Rinpoche states all things, when seen and understood in their true relation, are not independent but interdependent with all other things. A tree, for example, cannot be isolated from anything else. It has no independent existence, states Rinpoche. The Huayan school taught the doctrine of the mutual containment and interpenetration of all phenomena, as expressed in Indra's net. One thing contains all other existing things, and all existing things contain that one thing. This philosophy is based in the tradition of the great Madhyamaka scholar Nagarjuna and, more specifically, on the Avatamsaka Sutra. Regarded by D.T. Suzuki as the crowning achievement of Buddhist philosophy, the Avatamsaka Sutra elaborates in great detail on the principal of dependent origination. This sutra describes a cosmos of infinite realms upon realms, mutually containing one another. Thich Nhat Hanh states, "Pratitya samutpada is sometimes called the teaching of cause and effect, but that can be misleading, because we usually think of cause and effect as separate entities, with cause always preceding effect, and one cause leading to one effect. According to the teaching of Interdependent Co-Arising, cause and effect co-arise (samutpada) and everything is a result of multiple causes and conditions... In the sutras, this image is given: "Three cut reeds can stand only by leaning on one another. If you take one away, the other two will fall." In Buddhist texts, one cause is never enough to bring about an effect. A cause must, at the same time, be an effect, and every effect must also be the cause of something else. This is the basis, states Hanh, for the idea that there is no first and only cause, something that does not itself need a cause. Jay Garfield states that Mulamadhyamikakarika uses the causal relation to understand the nature of reality, and of our relation to it. This attempt is similar to the use of causation by Hume, Kant, and Schopenhauer as they present their arguments. Nagarjuna uses causation to present his arguments on how one individualizes objects, orders one's experience of the world, and understands agency in the world. Noa Ronkin states that while Buddha suspends all views regarding certain metaphysical questions, he is not an antimetaphysician: nothing in the texts suggests that metaphysical questions are completely meaningless, instead Buddha taught that sentient experience is dependently originated and that whatever is dependently originated is conditioned, impermanent, subject to change, and lacking independent selfhood. ↑ The pre-Buddhist Vedic era theories on causality mention four types of causality, all of which Buddhism rejected. The four Vedic era causality theories in vogue were:  sayam katam (attakatam, self causation): this theory posits that there is no external agent (God) necessary for a phenomena, there is svadha (inner energy) in nature or beings that lead to creative evolution, the cause and the effect are in the essence of the evolute and inseparable (found in the Vedic and particularly Upanishadic proto-Hindu schools);  param katam (external causation): posits that something external (God, fate, past karma or purely natural determinism) causes effects (found in materialistic schools like Charvaka, as well as fate-driven schools such as Ajivika);  sayam-param katam (internal and external causation): combination of the first two theories of causation (found in some Jainism, theistic proto-Hindu schools);  asayam-aparam katam (neither internal nor external causation): this theory denies direct determinism (ahetu) and posits fortuitous origination, asserting everything is a manifestation of a combination of chance (found in some proto-Hindu schools). ↑ The Dalai Lama explains: "In Sanskrit the word for dependent-arising is pratityasamutpada. The word pratitya has three different meanings–meeting, relying, and depending–but all three, in terms of their basic import, mean dependence. Samutpada means arising. Hence, the meaning of pratityasamutpada is that which arises in dependence upon conditions, in reliance upon conditions, through the force of conditions. "<ref name='FOOTNOTEDalai Lama199235'>Dalai Lama 1992, p. 35. ↑ Hoffman states: "Suffice it to emphasize that the doctrine of dependent origination is not a metaphysical doctrine, in the sense that it does not affirm or deny some super-sensible entities or realities; rather, it is a proposition arrived at through an examination and analysis of the world of phenomena ..."
↑ Harvey 1990, p. 54, Quote: "The main concrete application of the abstract principle is in the form of a series of conditioned links (nidanas), culminating in the arising of dukkha.". ↑ Harvey 1990, p. 54, Quote: "This [doctrine] states the principle of conditionality, that all things, mental and physical, arise and exist due to the presence of certain conditions, and cease once their conditions are removed: nothing (except Nibbana) is independent. The doctrine thus complements the teaching that no permanent, independent self can be found.". 1 2 Hopkins 1983, p. 163. 1 2 Monier Monier-Williams (1872). A Sanskrit-English Dictionary. Oxford University Press. p. 623. ↑ Monier Monier-Williams (1872). A Sanskrit-English Dictionary. Oxford University Press. p. 1078. ↑ Lopez 2001, p. 29, Quote: "Dependent origination has two meanings in Buddhist thought. The first refers to the twelvefold sequence of causation... The second meaning of dependent origination is a more general one, the notion that everything comes into existence in dependence on something else. It is this second meaning that Nagarjuna equates with emptiness and the middle way.". 1 2 3 4 Harvey 1990, p. 54. ↑ Walpola Rahula 2007, Kindle Locations 791-809. 1 2 Bhikkhu Thanissaro 2008. ↑ Alex Wayman (1984). Buddhist Insight: Essays. Motilal Banarsidass. pp. 173 with note 16. ISBN 978-81-208-0675-7. ↑ Jeffrey Hopkins (2014). Meditation on Emptiness. Wisdom Publications. pp. 148–149. ISBN 978-0-86171-705-7. ↑ David J. Kalupahana (1975). Causality: The Central Philosophy of Buddhism. University of Hawaii Press. pp. 6–7. ISBN 978-0-8248-0298-1. 1 2 Florin G. Sutton. Existence and Enlightenment in the Lankavatara-Sutra: A Study in the Ontology and the Epistemology of the Yogacara School of Mahayana Buddhism. State University of New York Press. pp. 270–271. ISBN 978-1-4384-2162-9. 1 2 David J. Kalupahana (1975). Causality: The Central Philosophy of Buddhism. University of Hawaii Press. pp. 1–53. ISBN 978-0-8248-0298-1. 1 2 Gethin 1998, p. 153. ↑ Ben-Ami Scharfstein (1998). A Comparative History of World Philosophy: From the Upanishads to Kant. State University of New York Press. pp. 512–514. ISBN 978-0-7914-3683-7. ↑ Guy Debrock (2012). Paul B. Scheurer, ed. Newton’s Scientific and Philosophical Legacy. G. Debrock. Springer. pp. 376 with note 12. ISBN 978-94-009-2809-1. ↑ Gethin 1998, pp. 153-155. ↑ David J. Kalupahana (1975). Causality: The Central Philosophy of Buddhism. University of Hawaii Press. pp. 54–60. ISBN 978-0-8248-0298-1. ↑ Genjun Sasaki (1986). Linguistic Approach to Buddhist Thought. Motilal Banarsidass. pp. 67–69. ISBN 978-81-208-0038-0. ↑ Gethin 1998, pp. 151-152. ↑ Williams 2002, p. 64, Quote: In the Mahatanhasankhaya Sutta the Buddha [stresses] that things originate in dependence upon causal conditioning, and this emphasis on causality describes the central feature of Buddhist ontology. All elements of samsara exist in some sense or another relative to their causes and conditions..
↑ Robert Neville (2004). Jeremiah Hackett, ed. Philosophy of Religion for a New Century: Essays in Honor of Eugene Thomas Long. Jerald Wallulis. Springer. p. 257. ISBN 978-1-4020-2073-5. , Quote: "[Buddhism's ontological hypotheses] that nothing in reality has its own-being and that all phenomena reduce to the relativities of pratitya samutpada. The Buddhist ontological hypothesese deny that there is any ontologically ultimate object such a God, Brahman, the Dao, or any transcendent creative source or principle." ↑ Williams, David M. (1974). "The Translation and Interpretation of the Twelve Terms in the Paticcasamuppada". Numen. BRILL Academic. 21 (1): 35. doi:10.2307/3269713. 1 2 Thich Nhat Hanh 1999, pp. 221-222. 1 2 Gary Storhoff (2010). American Buddhism as a Way of Life. State University of New York Press. pp. 74–76. ISBN 978-1-4384-3095-9. 1 2 Gethin 1998, p. 141. ↑ Robert S. Ellwood; Gregory D. Alles (2007). The Encyclopedia of World Religions. Infobase Publishing. p. 64. ISBN 978-1-4381-1038-7. 1 2 Stephen J. Laumakis (2008). An Introduction to Buddhist Philosophy. Cambridge University Press. pp. 113–115. ISBN 978-1-139-46966-1. 1 2 Peter Harvey (2001). Buddhism. Bloomsbury Academic. pp. 242–244. ISBN 978-1-4411-4726-4. ↑ Ray Billington (2002). Understanding Eastern Philosophy. Routledge. pp. 58–59. ISBN 978-1-134-79348-8. ↑ James McDermott (1980). Wendy Doniger, ed. Karma and Rebirth in Classical Indian Traditions. University of California Press. pp. 167 with note 2. ISBN 978-0-520-03923-0. ↑ Williams, David M. (1974). "The Translation and Interpretation of the Twelve Terms in the Paticcasamuppada". Numen. BRILL Academic. 21 (1): 35–63. doi:10.2307/3269713. 1 2 3 Ian Charles Harris (1991). The Continuity of Madhyamaka and Yogācāra in Indian Mahāyāna Buddhism. BRILL Academic. pp. 137–138. ISBN 90-04-09448-2. ↑ Gethin 1998, p. 74, Quote: Dependent arising, states Rupert Gethin, is "to be understood as in certain respects an elaboration of the truth of the origin of suffering.". 1 2 3 4 Ian Charles Harris (1991). The Continuity of Madhyamaka and Yogācāra in Indian Mahāyāna Buddhism. BRILL Academic. pp. 135–137. ISBN 90-04-09448-2. ↑ Peter Harvey (2012). An Introduction to Buddhism: Teachings, History and Practices. Cambridge University Press. pp. 71–72. ISBN 978-0-521-85942-4. ↑ Marco Pallis (2003). A Buddhist Spectrum. World Wisdom. p. 180. ISBN 978-0-941532-40-2. 1 2 Steven M. Emmanuel (2015). A Companion to Buddhist Philosophy. John Wiley. p. 60. ISBN 978-1-119-14466-3. ↑ Ray Billington (2002). Understanding Eastern Philosophy. Routledge. pp. 57–58, 73–74 note 1. ISBN 978-1-134-79348-8. 1 2 3 Dan Lusthaus (2014). Buddhist Phenomenology: A Philosophical Investigation of Yogacara Buddhism and the Ch'eng Wei-shih Lun. Routledge. pp. 124–127. ISBN 978-1-317-97342-3. ↑ Alex Wayman (1984). Buddhist Insight: Essays. Motilal Banarsidass. pp. 179–181. ISBN 978-81-208-0675-7. ↑ Alex Wayman (1984). Buddhist Insight: Essays. Motilal Banarsidass. pp. 180–187. ISBN 978-81-208-0675-7. 1 2 3 4 5 Alex Wayman (1984). Buddhist Insight: Essays. Motilal Banarsidass. pp. 182–187. ISBN 978-81-208-0675-7. ↑ Grant Olson (Translator) (1995). Buddhadhamma: Natural Laws and Values for Life. State University of New York Press. pp. 112–115, 171–172 with footnote 86. ISBN 978-0-7914-2631-9. 1 2 3 4 Damien Keown; Charles S. Prebish (2013). Encyclopedia of Buddhism. Routledge. pp. 269–270. ISBN 978-1-136-98588-1. ↑ Buddhaghosa; Bhikkhu Nanamoli (Translator) (1991). The Path of Purification. Buddhist Publication Society. pp. 607–608, 794. ISBN 978-955-24-0023-0. ↑ Mathieu Boisvert (1995). The Five Aggregates: Understanding Theravada Psychology and Soteriology. Wilfrid Laurier University Press. pp. 6–7. ISBN 978-0-88920-257-3. 1 2 Mathieu Boisvert (1995). The Five Aggregates: Understanding Theravada Psychology and Soteriology. Wilfrid Laurier University Press. pp. 9–11. ISBN 978-0-88920-257-3. ↑ Alex Wayman (1984). Buddhist Insight: Essays. Motilal Banarsidass. pp. 186–187. ISBN 978-81-208-0675-7. ↑ Alex Wayman (1984). Buddhist Insight: Essays. Motilal Banarsidass. pp. 184–186. ISBN 978-81-208-0675-7. ↑ Mabja Tsondru 2011, p. 67-71, 447-477. ↑ Geshe Sonam Rinchen 2006, p. 21. ↑ Williams 2000, p. 142. 1 2 3 Anyen Rinpoche 2012, pp. 58-59. ↑ Sogyal Rinpoche 2009, p. 169. ↑ Sogyal Rinpoche 2009, Kindle Locations 849-863. ↑ Hoffman 1996, p. 177. 1 2 Encyclopaedia Britannica. 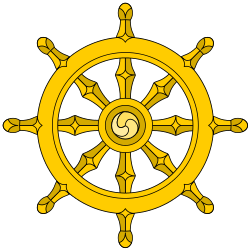 "Buddhism (religion)," http://www.britannica.com/EBchecked/topic/474042/paticca-samuppada. Accessed 25 February 2011. Thrangu Rinpoche (2001). The Twelve Links of Interdependent Origination. Nama Buddha Publications. Walpola Rahula (1974). What the Buddha Taught. Grove Press.